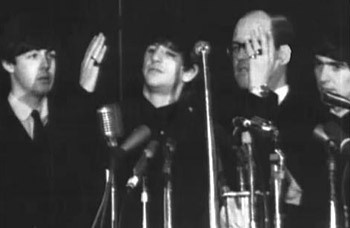 ABOUT THIS PRESS CONFERENCE: On February 11th 1964, while dominating America's airwaves, the Beatles traveled by train from New York City to Washington D.C. for their first American concert. The Beatles spent the afternoon giving interviews for television and radio in D.C., and posing for photographers. A press conference was held from the stage of Washington Coliseum before the doors were opened to the public. 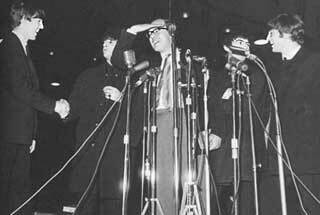 Standing at a group of microphones on the stage, with their voices reverberating in the mostly empty hall, the Beatles answered questions for the Washington D.C. press. 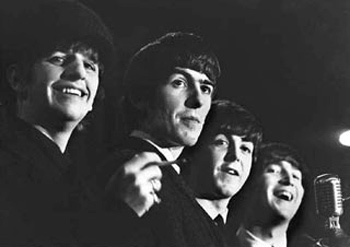 The Beatles again took the opportunity to display their humor, gaining some large laughs from the reporters. For the concert, the stage was set up in the round and the drum platform would be somewhat awkwardly rotated throughout the concert between songs so that everyone had a chance to see the Beatles. The next day, the Beatles would return to New York City by train for two performances at Carnegie Hall. Q: "When did the group first get togther?" GEORGE: "Well you see, Paul, John and George met at school about five years ago, and we met Ringo when we left school. And we've been the Beatles for three years." BEATLES: (singing) "We've been together now forty yeeeears!" Q: "Where did you get the name the Beatles?" JOHN: "I thought of it." Q: "Do the four of you ever fight among yourselves?" JOHN: "Only in the morning, ha." RINGO: "No, we're very good friends." Q: "Did you always have your hair this way?" JOHN: (laughing) "Only in the morning!" Q: "Did Ringo get his name from 'The Ringo Kid'?" RINGO: "No. From all this on me fingers. Can you see 'em?" Q: "Do you know who 'The Ringo Kid' is?" RINGO: "He was a cowboy, wasn't he?" Q: "How long do you think Beatlemania will last?" JOHN: "As long as you all keep comin'." Q: "Do any of you have any formal musical training?" 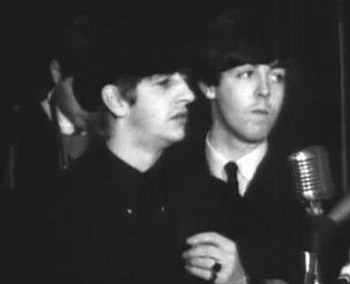 RINGO: "No, we just picked it up." Q: "What do you think of President Johnson?" RINGO AND JOHN: "Never met him." JOHN: (comically, to Ringo) "Oh, we're thinking alike!" PAUL: "We haven't met him." RINGO: "We don't know. We've never met the man... (pause) Does he buy our records?" Q: "What do you think of America, Amercican girls, and American audiences?" Q: "Can you compare them with Europeans?" RINGO: "They're all the same, you know." Q: "Have you visited the United States with any sense of revenge?" JOHN: "He's been reading that paper, hasn't he!" RINGO: "No! No, we just... (pause) come for the money." RINGO: "It's a lie. No. We're..."
Q: "Are English disc jockeys as important as American disc jockeys?" JOHN: "They're all as important as each other, if they've got any listeners." Q: "What was the big break that led to your success?" PAUL: "Making our first hit record. The BIG success was doing the Royal Variety show in front of the Queen Mother, and then right after that nearly at the same time, doing the London Palladium." Q: "This phenomenal popularity you have acheived, do you feel you owe it all to press agents?" JOHN: "We didn't get the press agents until we made it. We couldn't afford 'em before that." Q: "What do you think about the criticism that you are a bad influence?" PAUL: "I dunno, you know. I don't FEEL like a bad influence. (to John) Do you?" JOHN: "Nah, I think you're a GOOD influence, Paul." Q: "Is there any chance of the Beatles becoming knighted?" PAUL: "No. (pause) No, YOU may be, though." JOHN: "Can you imagine, Sir Ringo." Q: "Who writes most of the songs?" PAUL: "John and I write most of the records that we recorded. And Brian Sommerville (Beatles' Press Agent) does all the lyrics." PAUL: "He's a BEAUTIFUL lyricist. Listen to him, now. Go on, Brian." PAUL: "He's fantastic. No, it just comes and goes, you know." Q: "Who are the Beatles' favorite performers?" JOHN AND PAUL: "Tommy Roe." Q: "How long will you be in America?" PAUL: "It's just a week. About a week." Q: "What do you like or dislike about America?" JOHN: "We like it all." RINGO: "Yeah. We haven't any dislikes yet." PAUL: "I don't. I love the snow." Q: "Have you ever really been afraid of the large crowds?" PAUL: "We enjoy it, you know. There's enough police, anyway." Q: "What has been your most exciting moment in the last year?" PAUL: "There's been a lot of them. You know, meeting the Queen Mother at the Royal Command Performance, being number one in America, coming to America, traveling..."
PAUL: "We've enjoyed America. Been a lot of them, though." Q: "Are the Beatles still number one in Europe?" JOHN: "Well, Europe's got a lot of lists." GEORGE: "A lot of countries." PAUL: "A lot of hit parades." JOHN: "No, the record's gone down to 7 or something." PAUL: "But it's been out about 12 weeks... longer than 12 weeks in England." JOHN: "It's been out about 3 months." GEORGE: "'She Loves You' is still in the Top 20 and it's been out 25 weeks."